Aquest article és una síntesi d’un treball de recerca que vaig portar a terme. Els diferents subsectors del turisme generen una infinitat d’ocupacions amb un nivell formatiu que condiciona la qualitat del lloc de treball. Els requisits formatius dels llocs de treball són els que condiciona la qualitat de l’ocupabilitat en el mateix sector. Actualment, l’oferta formativa reglada en turisme es basa amb la formació professional, el grau en turisme i l’oferta de màsters i addicionalment els programes de doctorat. – L’activitat turística genera un 12,27% d’ocupabilitat respecte a totes les activitats econòmiques espanyoles. Les CC.AA que generen més ocupabilitat turística, són Catalunya amb un 17% i Madrid i Andalusia amb un 15%. Però Balears i Canàries destaquen perquè els seus ocupats en turisme respecte del total de les activitats econòmiques nacionals representen cadascuna el 26%. A diferència de Catalunya que té un volum del 12%, Madrid un 11% i Andalusia un 13%. – Pel que fa a subsectors de l’activitat turística, l’hostaleria és qui té l’impacte més important a nivell d’ocupabilitat. Quant a generació de llocs de treball té un volum del 64,35% i destaca el sector de serveis de menjars i begudes amb un 76,21% del total de l’hostaleria. A causa de aquest volum d’ocupabilitat, en totes les dades treballades aquest sector és el que condiciona els resultats. – Les franges d’edats que predominen en el sector turístic són, les de 30 a 44 anys amb 43,32% i la franja de 45 anys i més amb un 35,71%. – És un sector amb un 78,48% d’assalariats i un 21,49% d’autònoms. Del conjunt d’assalariats, el 66,57% ha disposat d’un contracte indefinit i un 33,43% d’un contracte temporal. Quant a jornada laboral, d’aquests assalariats, el 57,56% treballa a jornada completa i el 16,73% a jornada parcial, però hi ha un 25,70% que no es tenen dades. – És un sector que predominen els estudis secundaris amb un 62,43% dels ocupats, els estudis superiors amb un 26,78% i els estudis primaris amb un 10,63%. Dels estudis secundaris destaca l’hostaleria amb un 67,38% d’ocupats amb estudis secundaris, repartits entre els serveis d’allotjament amb un 61,86% i els serveis de menjars i begudes amb un 69,10%. També destaca transports de viatgers amb un 62,38% d’ocupats amb estudis secundaris i altres activitats turístiques amb un 48,91%. Dels ocupats que tenen estudis superiors, destaca altres activitats turístiques amb un 46,67 i amb diferència transports de viatgers amb un 28,47% i hostaleria amb un 19,20%. Pel que fa als ocupats amb estudis primaris, destaca l’hostaleria amb un 13,19% seguit de transports de viatgers i amb diferència, altres activitats turístiques amb un 4,41%. – El mateix sector turístic fruit de les necessitats provocades per l’estacionalitat i la demanda, no distingeix les titulacions de Grau i Cicle Formatiu. Malgrat que a escala formativa, els diferents plans docents estan elaborats per un conjunt de competències que diferencia el CFGS i el Grau, l’estament universitari està reconeixent implícitament que hi ha un superposició de determinats continguts del CFGS d’Hoteleria i Turisme amb l’oferta de Graus. Així ho demostra la regulació universitària espanyola i catalana amb matèria de reconeixement d’ECTS pels titulats de CFGS. El reconeixement de crèdits ECTS de les universitats catalanes i centres adscrits que apliquen als CFGS d’Hoteleria i Turisme està amb un 13,45%. Generating and compensating demand. Increasing profits! The old Yield/Revenue Management idea of a single demand curve is over. We have to generate demand/s with new segments. We have to compensate current demand with the new ones. We have to increase profits. We have to reinvent Yield/Revenue Management. 1) “Revenue Management: A Path to Increased Profits”. PROFITS!!! Clear? 2) “…adding the creation and direction of demand to the present #revenuemanagement focus of managing current demand”. Waves Management!!! Clear? Why did I highlight this sentences from this book? Because, I Touristologistly believe, that they represent something fundamental AND usually missing in nowadays training, consultancy, practice of Yield/Revenue Management. First, the focus on pricing techniques (that are very interesting, except when they are just… mark down the price with low occupancy!) and not the focus on profit. Second AND MORE IMPORTANT, paying all the attention on CURRENT demand and a lack of focus on demand generation from NEW segments. Segments with different patterns that you can seduce in different ways in order that they appear in your Hotel/Tourism enterprise when is more convenient to you. Furthermore, you can compensate high demand of one of the segments with low demand of the others AND THE OTHER WAY AROUND. So, compensate low demand of one of the segments with high demand of the others. We are wave managers, remember? Here you can see a graphic representing waves compensation! Let’s see an example about waves compensation. We can think about Shangri-la … they have a problem of low occupancy (better to say a problem of less than desirable profit? YES!!!) during weekends because most of their customers are business people. They Touristologistly make the most of nowadays social tendency… I want to be the best professional BUT ALSO THE BEST Parent!!! So, you can promote to your customers… use you hard earned points of OUR loyalty program to appear in OUR hotel during weekends and enjoy especial activities for your kids. Not only you are a great professional you are the parent of the month! By the way, good example of Versions Of Me!!! The business people doesn’t appear during the weekends BUT yes, the lovely parent! You can read this article and see how they are practicing these ideas. “In 2017 Shangri-La Hotel, Shenyang, in Shenyang China, launched its second round of “K20 Activities.” This two-day training program, available to travelers and locals, pairs up to 20 children ages five to twelve with professionals at the property for fun “training” sessions that provide insight into the in’s and out’s of luxury hotel operations.” Interesting practice Shangri-la!!! At the end of the day, these two ideas conveyed in the two sentences that we have been talking about (improving profits and discovering new segments) are highly connected. When you have new segments, you can sell to them complementary products, as a matter of fact, F&B or beds can be the complementary ones because, for specific segments, the principal components of the product are related with their main motivation. It can be good service and attitude with their dog as we saw in this example about Disney OR to enjoy doing your favorite activity surrounded with people that like it or want to be a professional or they are already professionals on it… like the example of Chip Conley’s first specialized hotel on Rock music lovers and based on Rolling Stone magazine !!! It is obvious, that in those scenarios, the possibility to sell these extra activities and the basic ones without a discount will increase your TRevPar. For instance, if you create a tour for architects from architect’s point of view, visiting the city where you have your hotel, offering also possibilities to sign in an internship with a local architect studio, etc. You can use Long Tail Theory and try to promote and distribute your package in any Architects university around the world. This promotion and distribution can be a win to win situation for everybody! Here you can find more information about special packages for Architects. The same can happens, if you create a specialized package for grandparents travelling with their grandkids where you teach mathematics (a fun review for the grandkids and an opportunity for the grandparents to become the perfect tutor) or teaching basic coding to develop a native mobile app (where the kids will be the tutors!!!) to appear in a specialized social networking site as grandparents.com can also generate, again, this win to win situation! All these actions will also increase your GopPar! More opportunities to generate extra revenues, or commissions for special activities, less cost of promotion and distribution… I love the application of long tail theory in Touristology!!! Yield/Revenue management is changing a lot and we need YOU to create, improve, define these changes!!! As Alan Kay says “The best way to predict the future is to invent it”!!!! We are Touristologist! We do that!!! Do you want to join US? I will be here, in the cloud, waiting for you!!!! Comentaris tancats a Generating and compensating demand. Increasing profits! Create something ORIGINAL for specialized segments! These weeks have been very intense! A proposal to create a start-up, a consultancy, the first classes and seminars…. I love intense times related to Touristology!!! A copyologist’s thought that has appeared over and over during these activities it is the idea that Tourism enterprises Or Tourism destinations must begin the creation, communication and commercialization of Tourism products WHEN THE TOURIST IS ALREADY HERE. How on earth is possible that in XXI century this idea still alive? I will provide two examples based on my experiences during these weeks. I hope you enjoy them AND HELP TOURISTOLOGY TO DESTROY THIS OLD AND NO PROFITABLE IDEA!!! The other day, I shared with all of you this video, introducing the AirBnB initiative related to Jessica Parker and asked a simple question… What would you do in order to remain competitive? WoW! Offer services to Tourists of other enterprises because they are here? I don’t think this is, necessarily, a bad idea BUT… is it a Touristologists’ idea? Is it a profitable one? Is it NOT much better that YOU define YOUR segment then, try to create customized and aggregate components of products in order to satisfy their needs USING the chain of value that you build and control? AirBnB is doing just this! Define a segment (Jessica Parker’s fans), customize and aggregate components of products to seduce them (meet the star, do the activities that She did in the films…) AND, of course, making the reservation through AirBnB!!! Something similar happened to me when I had the opportunity to be an external consultant for a hotel. They spent hours and hours talking about how the hotel is refurbishing its rooms, the swimming pool, the reception… in order to get “quality” Tourism. 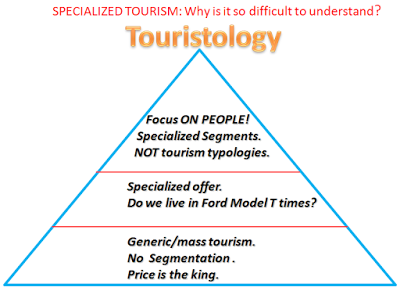 If you want to seduce more profitable Tourists you have to use Touristology’s frameworks! Define a segment, customize and aggregate an offer to seduce them through a chain of value that you control/manage! To summarize, spend less budget on refurbishing the hotel and more budget on refurbishing YOUR Chain of Value!!! Stop complementing / copying product of other enterprises. Stop refurbishing. Create something original for specialized segments! Don’t be copyologist… BECOME A TOURISTOLOGISTS!!! Comentaris tancats a Create something ORIGINAL for specialized segments! Are Augmented Reality (AR) and Machine Learning (ML) the new, new thing? This summer I have been doing an intellectual travel deep inside Augmented Reality (AR) and Machine Learning (ML). I mean, I listened to videos, read books, talked with experts and in parallel I began to use this knowledge developing native mobile apps and thinking how to apply them to the Tourism sector, What else?!?!? First, I enjoyed Augmented Reality then, I fell in love (again) with Machine Learning (at the end of the day is a close relative of the Intelligent Systems that I learned doing my doctoral thesis). Soon, I realized that the two concepts are very related and that together can improve plenty of operations and processes of any Tourism enterprise OR Tourism destination! Machine Learning can create groups (segments!) classifying things, make recommendations (like Netflix or Amazon are doing). I love Silicon Valley series, here you can enjoy a (funny) demo of Machine Learning… I hope we can create something more useful in OUR classes/seminars!!! These possibilities to create groups (classify) people or objects, make customize recommendations, together with the possibility of show this to YOUR Tourists in real-time right here right now, open a lot of possibilities. Specially, if you are in a trip and you need access to CUSTOMIZED information, products/service, contacts…. Just remember, the winner in tourism will be the ones able to provide support to the Tourist from the beginning to the end of the trip!!! Definitely, AG and ML can help you on this matter! A very good way to get the customized information in real-time is ML… Now Yes! AR+ML can be the new, new thing! But… BE AWARE! Customization without privacy can be a nightmare! The user, at any time can decide if He/She wants to get o send this customized information OR changing the rules of how to customize this information (Versions of Me, remember?) AR without customization it is NOT the new, new thing! We don’t want generic information about (people, product/services…). We want customized information NOW and HERE! AR + ML can allow us to put web 2.0 business model in action! Syndicated= Buying/selling anything right here, right now! …wait a moment Jordi… How can you trust the buyer and the seller? How you can create smart contracts between them? How you can send/get payments in a secure way? Ummm does Blockchain ring a bell to you?!?!? Pro-Am = Can we organize a group? Right here, right now??? Let’s try to apply these ideas in Marketing OR in Yield/Revenue Management, for instance! Machine learning can do marketing research in real-time based on your behaviour, in the things that you are saying, in the things that you are watching… right here, right now! Based on this real-time marketing research your organization can customize the 4P’s of Marketing (you know how much I respect this classic of Marketing and how funny I find the people that year after year say that they have find a new P or the 4X’s or the 6 S’s. Classics are classics and they are timeless!). You can customize the product/service AND the servuction process. You can customize the price using some pricing ideas… opacity, up-selling, cross-selling…discounts or customize/new services for a group created by the Tourist! You can customize the promotion and do it right now, right here using the knowledge that Machine Learning provide and the power of improving the reality that Augmented Reality provide to your apps! You can change and customize the place using the power that Syndication provides… By the way, do you really thing that the smartphone is the place? Can you think about one example of how to use Machine Learning and Augmented Reality to improve the processes (Marketing, Yield/Revenue Management, Human Resources… of your enterprise? Do you think that doing that you can earn a competitive advantage? Come on Touristologists! YOU are the best minds working in the best sector ever! Time to proof it! We love connecting dots! We are Consilient Thinkers loving to nimbly pass from Web-engineering to Touristology!!! Comentaris tancats a Are Augmented Reality (AR) and Machine Learning (ML) the new, new thing? The other day, I was learning about Nigeria one of the most powerful countries in Africa. Nowadays they try to create start-ups based on new technologies, they try to educate its population in coding skills… Perfect! I also learned that they had oil… BUT the enterprises which extract, refine and distribute it are big corporations. So, they have the oil (and all the possible side effects: Pollution, etc) and others get the profit. Well, except for a few local people that allow this and they are also very rich! BUT… Jordi it is not this blog about Touristology? Calm down, Touristologists! I am the king of metaphors, remember? For some countries, Tourism is OUR oil! We have to decide if we want to play Nigerian model OR to play the game as other countries (You-know-the-ones) which extract, refine and distribute their own oil! If you manage your Tourism resources, if you select your own segments, if you create tourism packages to satisfy their necessities that will be better satisfied during a trip, if you communicate and commercialize these packages… then you will have YOUR own Tourists. To them you can propose international routes, to them you can sell other Tourism destinations!!! Then, we would be a Tourism destination leader!!! On the other hand, if you don’t that… the big share of the profits will be for other enterprises which will get the trust and will manage THEIR Tourists… AND local population will get the bad side of the coin…. Carrying capacity!!! Gentrification…! Of course, few local people also will get profit and maybe for this reason they don’t see the necessity to propose a stimulating alternative for everybody OR maybe it is because a lack of Touristology’s vision! Do you want to play Tourism? Play it in the right way… Touristology’s way! Create, communicate and commercialize your own packages. You will get less side effects, more profits, higher salaries and happier citizens. Comentaris tancats a Is Tourism OUR oil? 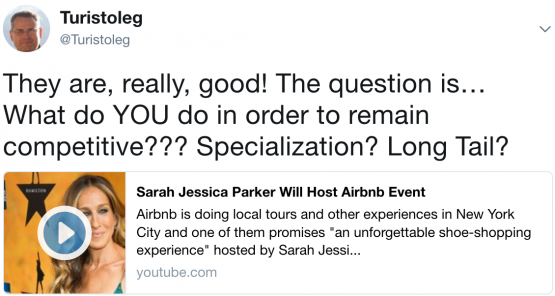 Is the gig economy related to generic or specialized Tourism? BOTH!!! The other day, a group of Touristologists decided to give a presentation about Waynabox a new OTA in the European field selling trips AND SURPRISES! Interesting enterprise! But… generic! Basically, because the main driver for the Tourists, airline companies, hotels and even for the new travel agency is… PRICE! So, in order to be successful, they need economies of scale… meaning a lot of customers. For the Tourists, you get a surprise trip. Yes, BUT please don’t forget… at a low price! For the Airlines companies and Hotels, you get customers when you have a low occupancy or empty seats. So, they use a basic principle in Yield/Revenue Management… Mark down the price. I hope that as managers…This is NOT all they will get!!! Remember, we are wave managers. So, maybe we can create an example of specialized tourism where less Tourists and more revenues (RevPar, TRevPar) AND PROFITS (GopPar) can be a better OR COMPLEMENTARY business model for all the members of the chain of value! Few days ago, appeared this article by John Hagel about the gig economy. I found the article very interesting! He explains that gig economy can be for “Routine tasks” AND for “Creative problem solving”… I began connecting the dots between trips, surprises and opportunities in the gig economy! To me, “Routine tasks” sounds generic and “Creative problem solving” sounds to opportunities for specialized Tourism! Are you a specialized freelance with a set of high demand skills? What about you can go to a different city apply your skills and then enjoy the city? Do you think that companies from around the world are willing to hire the bests experts in the world? Do you think that this combination of a job and Tourism can seduce these experts? Do you think that they can use/enjoy an upgrade in the airline company in order to relax before, during and after the trip? Do you think that, for this segment, location and services of a hotel are more important than the price? Ummmm it sounds that you can use the butterfly strategy here!!! Can you describe the chain of value of this segment? Can you describe the operations and processes in order to seduce both the segment and the enterprises? Can you prove that you are one of the best minds working in the best sector ever? I love Touristology’s games!!! What about YOU??? Comentaris tancats a Is the gig economy related to generic or specialized Tourism? BOTH!!! Which Company/Tourism destination will win in Tourism? The one(s) giving support to the Tourists from the beginning to the end of the trip! Will WoT/IoT help to give this support? Definitely! Will Blockchain /Smart Contracts help to give this support? Definitely! Touristologists changing the way we enjoy, manage and define Tourism!!! One month ago… this was my tweet! Teaching my students how to code his/her dreams in native mobile apps (iOS/Android) is one of the most gratifying things in my life!!! On Monday I will practice it! It will be the first day of a new subject! I love first days!!! I have been working in mobile development for the last 5 years, helping both, big organizations and start-ups to select the best approach to a multi-screen world. 1) Responsive web design: I enjoy dealing with Bootstrap and its approach to responsive web design! 3) Native applications: I love reusing my knowledge of Java and XML in Android and discovering the benefits of functional programming. At the end of the day… I’m an old dog learning new tricks… first OOP (Object-Oriented Programming who better than Steve Jobs to learn about it!) now adding Functional Programming and getting Functional Reactive Programming! And… of course I fell in love with Swift at first sight!!! So, Responsive Web Design, Hybrid or Native Apps. Which is the best approach? As I always say… an intelligent answer begins with …. “It depends”. You have to define the kind of operations and processes that you want to offer to the Tourists/Customer then, based on the kind of device they are mostly using, you have to make up your mind. It will also depend on your team, in the kind of expertise that they have… in their motivation to learn! It will also depend on your budget…. So, there is NOT a perfect solution! In life, as in web-engineering as in Touristology you have to learn how to wear different HATS! To provide a good servuction…put your hotelier hat on! To create, communicate and commercialize a tourism package for a generic or specialized group… put your travel agent hat on! To sell NOW for THIS Day/hour… put your Yield/Revenue Manager hat on! We are Consilient Thinkers, nimbly passing from one Science to another, smiling and loving to dance…even under the rain!!! Let’s go for them!!! I, definitely, love first days!!! Comentaris tancats a Let’s code some dreams!!! Help the world to help YOU!!! Some time ago, I wrote down a manual about Touristology, where I explained that we live in a connected world (I was following the ideas of Thomas Friedman and his marvelous book “The world is flat”). This connected world is especially true in tourism. We can do business with everyone. The world is OUR office! So, if we want to succeed in tourism we have to do things globally! We send tourists around the world. We have to seduce tourists from around the world …We can create international routes in order to satisfy the needs of specialized or generic tourists. What happens in other countries affects the security of all countries: wars, pollution, poverty, LACK OF ALTERNATIVES FOR LOCAL POPULATION … If we want to increase security, to reduce pollution, to take care of the culture of the world, we have to implement measures on a global level. If we want to reduce pollution we have to do things globally. Which is the role of Touristology in this goal? We must teach countries worldwide about how to create richness, employment, and protect their/ OUR culture using Touristology’s methodology. This will reduce their poverty, give them alternatives and, consequently, improvements to our security! This will also give opportunities for Touristologists around the world! Yes, Touristologists… We definitely have to help the world to help YOU!!! Comentaris tancats a Help the world to help YOU!!! Groups, S3 and Your own SnS! Last week, I had the opportunity to be a Lecturer in a Master for future Entrepreneurs. It was very interesting and I, really, enjoyed the experience! – Jordi, why is specialization so important? In a GLOBALIZED world, there are plenty of people, enterprises… with a lot of money and contacts to create economies of scale, if the most important thing that you offer it is a low price… you will lose the battle! You can apply this pyramid to ANY sector! – I said to the disruptive startups creators. A) The person married/ in love with a younger person. As you seduce a segment that is NOT a Dr. Frankenstein’s segmentation they will love to talk about their experiences. So, you can create your OWN Social Networking Site. I always believe that paraphrasing Alan kay “if you want to be serious about SnS you have to create your own ones.” This is very important because the competitive advantage of generic products/services is economies of scale BUT in specialized ones the competitive advantage comes from gaining the TRUST of the segment. You can sell MORE, both to the members of the community (you can sell anything interesting to them) and for any person/organization trying to seduce them. I try to represent this idea with this graphic that we saw in this posts. You know me… “Groups” is another word carved into my mind. The possibility to create groups is a leverage to get a profitable and scalable business. Inside a specialized and INTERNATIONAL community is far easier to create groups and take the most of the PRO-AM idea. Groups in order to get discounts for services. Groups in order to get customized product/services for the community, even to create, communicate and commercialized new product/services based on the interest of your community. I explained all these ideas to the entrepreneurs. Maybe some of them will take up the glove and apply these ideas in their disruptive startup… It will be my honor and my privilege to share their adventures, their success OR their opportunities to begin again, here! Keep dreaming, keep working, keep enjoying Touristology!!! Comentaris tancats a Groups, S3 and Your own SnS!